Zagg – makers of accessories for popular mobile devices including the iphone, iPad, iPad2, HTC android phone and more – are giving away 1 FREE iPad2 every hour all of day this Black Friday (tomorrow). You read it right. It is 1 FREE iPad2, EVERY Hour all day long. That makes it 23 iPad2 units (if you exclude the following midnight / break of dawn Saturday). How to Enter? Simply visit the Zagg iPad2 Giveaway page here, enter your name and email address and click Submit Entry. The giveaway starts at midnight i.e. 12 AM on Friday November 25th 2011. You can enter once per hour on the site, so you effectively have 23 chances to win a free iPad2. Good luck. Remember, you have to be “in it” to “win it“. 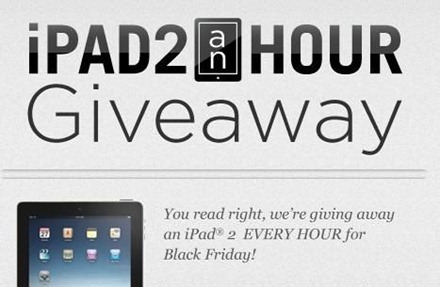 One Response to "Win A FREE iPad Every Hour At the Zagg iPad2 An Hour Giveaway This Black Friday"